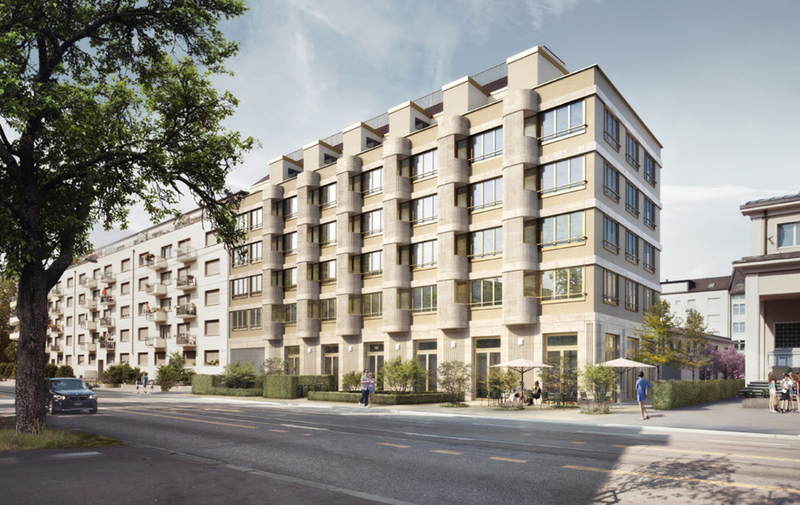 A seemingly simple, six-story apartment complex is going up in Zurich, Switzerland, and is putting to the test a number of new technologies that showcase a more sustainable approach to new construction. The project, Hohlstrasse 100, is designed by Dietrich Schwarz Architekten and is rising next to an existing, two-story commercial space that's also being renovated and connected to the new building underground. The firm's namesake principal has written extensively on environmental concerns in architecture and advocates a view of architectural history “from modernism to the ‘one planet society,’” which has manifested itself in projects like the 1996 Solarhaus I and the 2007 Eulachhof "zero-energy" housing complex. Claiming that “architectural and spatial planning” is the cause of greater than 40 percent of global energy consumption, Schwarz has proposed that future structures "will be created in which the building envelope and building service systems complement one another optimally." That ethos is being advanced in Hohlstrasse 100, which is, in part, supported by the Swiss Federal Office of Energy. Loaded with new technology, the residences will be a pilot for a new form of vacuum-insulated glass windows, hot water, and other monitoring systems, as well as new phase-change materials. The windows will also feature unique soundproofing, tested at Empa at ETH Zurich, that will allow them to be opened to the noisy street below for natural ventilation. Hohlstrasse 100 is also testing ground for aerogel insulating technologies, designed in the lab of Jannis Wernery at Empa. 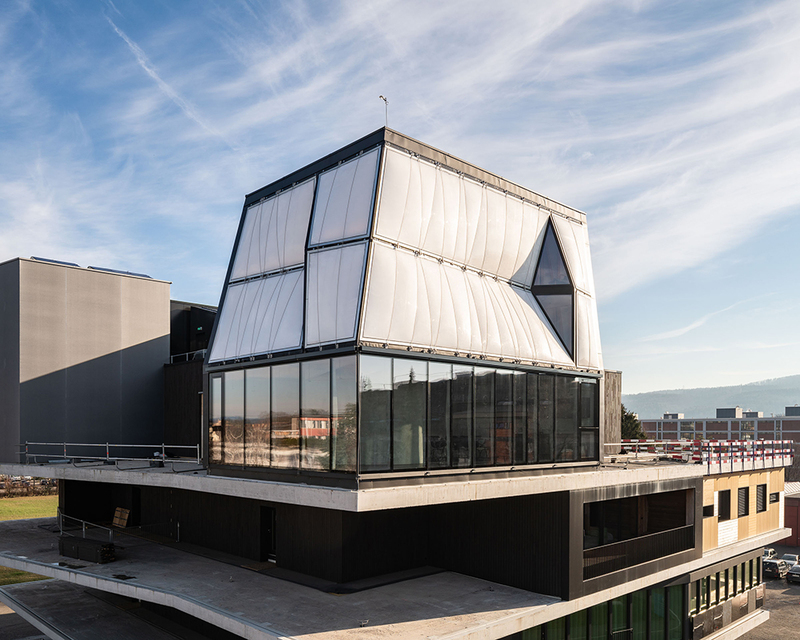 While aerogels have been used in many renovations, and also recently at the research-showhome DFAB HOUSE, Wernery says this is first new construction in Switzerland to create a facade entirely using aerogel. The material, an ultralight gel that uses gas instead of a liquid, has incredibly low density and thermal conductivity. Overall, the building is extremely high-efficiency in terms of insulation abilities for its size. The ultra-thin wood, MDF, and aerogel facade make it a primarily a wood structure coming in at just 135mm. Although aerogel is costly, in expensive cities like Zurich the gain in interior square footage (and its attendant profitability) more than compensates for the additional price while providing long-term energy efficiency, according to Wernery. For the architects, this thinness and space efficiency is also part of the building's conceptual conceit. 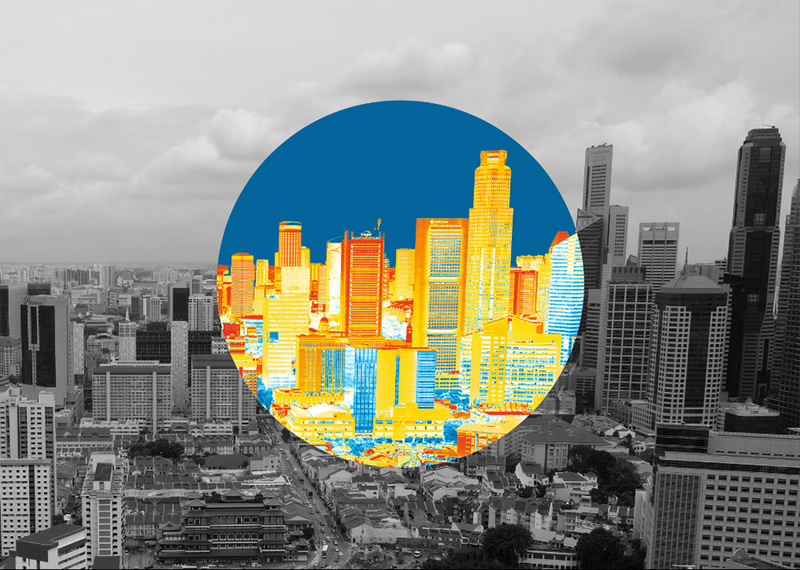 It reads with the “compression” that so distinctly defines modern urban buildings and cities themselves. Global construction continues to steam ahead, even while seemingly mundane building materials (like sand) become rarer and more precious, and construction industry's carbon dioxide emissions contribute to global climate change. The building industry seems to be demanding new solutions, but scalable alternatives remain scarce. Enter the Block Research Group at ETH Zurich. The group, which is based out of the Institute of Technology in Architecture at the Swiss school and is led by Philippe Block and Tom Van Mele, takes a “geometry-based approach” to assessing and attacking engineering problems using technology like algorithmic design and 3-D printing. Most recently, at ETH’s pavilion at the World Economic Forum, which took place earlier this winter in Davos, the group unveiled its solution to building in an age of tightening resources: a "functionally integrated funicular floor." The flooring solution builds on the group's rib-stiffened funicular slab system, which was inspired by tile vaulting and was on display at the Beyond Bending exhibition at the 2016 Venice Architecture Biennale. It relies on doubly-curved shells to bear loads and uses up to 70 percent less concrete than typical construction methods. The structure also minimizes stress even in the thinnest areas, making it possible to build with weaker materials, like recycled concrete, which the lab is currently using. It also permits space to embed pipes, wires, and mechanical systems in space created in the floor. Currently, the lab is collaborating with the Architecture and Building Systems lab at the university to see if HVAC systems can be placed within the flooring. https://vimeo.com/312082531 However, despite its significantly decreased use of concrete, the complex geometry could make for expensive and wasteful formworks, which themselves require intensive labor to build and remove. The Block Research Group is also collaborating with the Digital Buildings Technology lab to investigate the use of 3-D printing to mitigate these challenges. This year, the research group is gearing up to use its new floor system and other technologies in the ongoing experimental NEST HiLo (high performance, low energy) project, a prototype two-bedroom apartment for ETH visiting faculty that features an array of cutting-edge construction and environmentally conscious technologies, being constructed in Dübendorf, Switzerland. 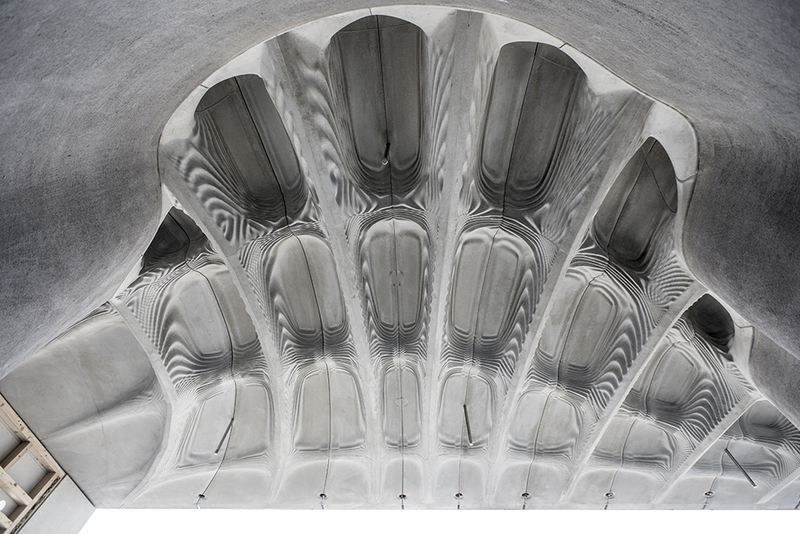 A research team led by Jamin Dillenburger, an assistant professor at ETH Zurich, has recently produced and installed a concrete ceiling shaped by 3D-printed sand formwork. Dubbed the “Smart Slab,” the 1000 square-foot ceiling is significantly lighter and thinner than comparable concrete ceilings. The concrete slab is a component of ETH Zurich’s ongoing DFAB House project. The DFAB House is a load-bearing timber module prefabricated by robots. According to ETH Zurich, Dillenburger’s research group “developed a new software to fabricate the formwork elements, which is able to record and coordinate all parameters relevant to production.” In effect, the design of the ceiling is the product of the team-created software rather than analog design or planning. Following the design and digital testing phase of structural elements, the fabrication data was exported for the creation of 11 pallet-sized, 3D-printed sand formworks. After fabrication, each segment was cleared of sand particles and prepared for concrete spraying. The spray consisted of several layers of glass-fiber reinforced concrete. At its thinnest point, the concrete shell is less than one inch thick. After hardening for two weeks, the 11 concrete segments were joined to create the approximately 15-ton floor plate. While the underbelly’s contours were formed by 3D-printed sand casts, the ribbed grid above was shaped by CNC laser-cut timber formwork. The load-bearing ribs, resulting from timber formwork, were outfitted with a series of tubes for the insertion of steel cables both horizontally and vertically. These post-tensioned ribs carry the principal load of the “Smart Slab.” In placing the principal load above the concrete shell, the research team was able to insert complex geometric features below. The “Smart Slab” is not ETH Zurich’s first execution of an ultrathin concrete unit. Earlier this year, the university fabricated an undulating, two-inch thick roofing unit for a new live-work space in Zurich. 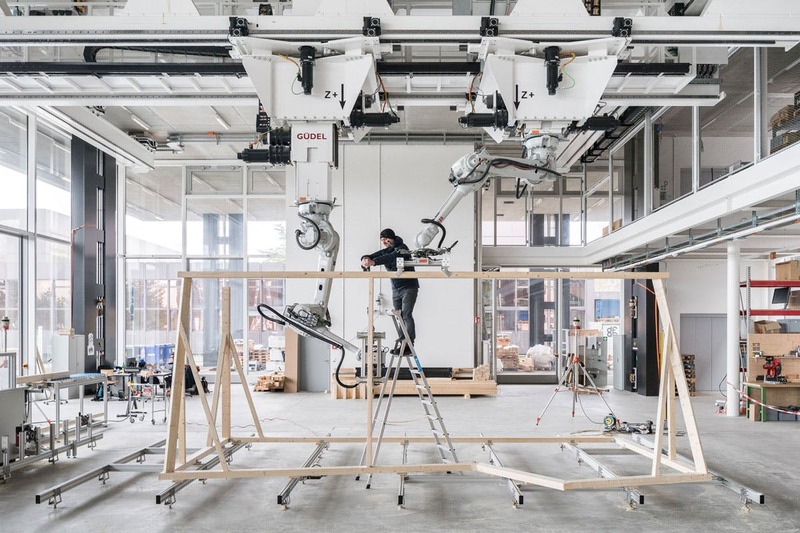 Researchers at the Swiss Federal Institute of Technology (ETH) in Zurich, Switzerland, are giving timber construction a mechanical leg up with the introduction of prefabricated, robotically-assembled timber frame housing. Together with Erne AG Holzbau, a contracting firm that specializes in timber, researchers at the institute’s Chair of Architecture and Digital Fabrication have developed Spatial Timber Assemblies, a system for digitally fabricating and constructing complex forms from timber. After a model of the structure has been laid out, robotic arms mounted in the ceiling of the assembly chamber are capable of building the required parts as well as putting them together. First, one arm picks up a beam and holds it while a human trims the piece into the proper size and shape. Then, a second robot arm pre-drills the holes needed for attaching the beam to the structure; finally, both robot arms work together to precisely place the beam as a human attaches it. Thanks to algorithms developed by the researchers, the arms are able to constantly recalculate their location in space and how to move forward without bumping into each other (or humans on the job site). ﻿﻿ A major advantage of Spatial Timber Assemblies is that the structures built this way carry their load-bearing capacity structurally, and don’t require reinforcing plates or any additional steel. If the overall design changes during construction, researchers are able to calculate a new, optimized framing solution using load-distribution algorithms. The system is more than theoretical. ETH researchers are currently using it to assemble six unique modules, which will join to frame the top two floors of the experimental DFAB HOUSE in Dübendorf, a suburb of Zurich. Once installed on site, both floors will have distinct rooms across 328 square feet of floor space. The final design, which uses 487 individual beams, will be wrapped in a clear plastic facade so that the underlying timber structure can remain exposed. Advancements in robotic construction are advancing rapidly, and ETH researchers have been developing robots that weld, spray concrete, and stack bricks to create forms that would have been difficult to build previously. And if the ETH needs help decorating the interior of their research house, robots can now assemble IKEA furniture, too. 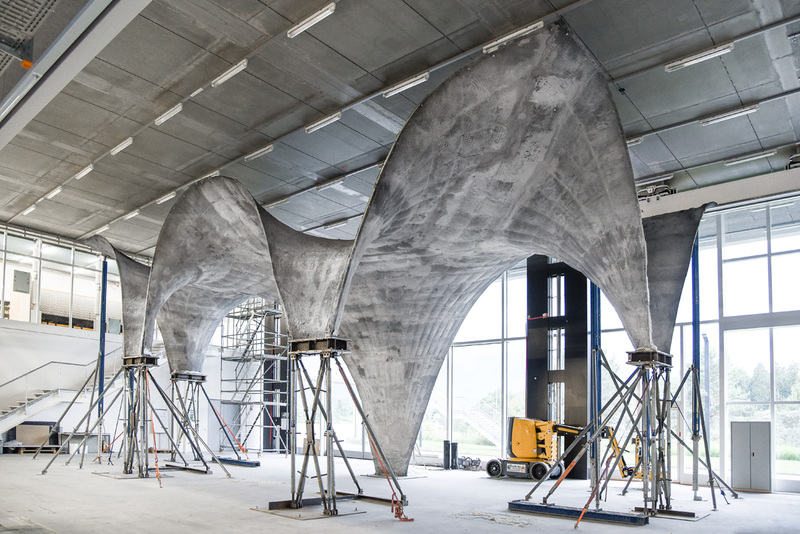 A full-scale prototype of the design was the culmination of a four-year research project by ETH Zürich, and now the thin-shell integrated system's concrete roof is under construction. The razor-thin assembly, built over the course of six months, tapers to an impressive one-inch thickness at the perimeter, averaging two inches thick across its more than 1,700 square feet of surface area. The ongoing project, sponsored by ETH Zürich, NCCR Digital Fabrication, and Holcim Schweiz, will lead to the completion of a rooftop apartment unit called HiLo, which will offer live-work space for guest faculty of Empa, the Swiss Federal Laboratories for Materials Science and Technology. The rooftop structure rises about 24 feet high, encompassing 1,300 square feet. Innovations in thin-shell building techniques were explored by the Block Research Group, led by Professor Block and senior researcher Dr. Tom Van Mele, together with the architecture office supermanoeuvre. The team purposefully avoided wasteful non-reusable formwork, opting instead to develop a net of steel cables stretched into a reusable scaffolding structure. The cable net supported a polymer textile that forms the shell surface. According to ETH Zurich press release, “this not only enabled the researchers to save a great deal on material for construction, they were also able to provide a solution to efficiently realise completely new kinds of design.” The construction technique leaves the interior floor area below the roof relatively unobstructed, allowing interior construction work to proceed concurrently. Altogether, this method is expected to condense construction to eight to ten weeks. Block Research Group and NCCR Digital Fabrication were able to digitally model dynamic forces wet concrete applies to the lightweight cable net and textile formwork, so that the overall geometry and structuring of the surface can be calibrated to produce an accurate result. This level of optimization is perhaps most evident in the capacity of the reusable formwork system to hold around 25 times its own weight (20 tons of wet concrete will eventually load onto the formwork). Experts from Bürgin Creations and Marti sprayed the concrete using a method developed specifically for this purpose, ensuring that the textile could withstand the pressure at all times. Together with Holcim Schweiz, the scientists determined the correct concrete mix, which had to be fluid enough to be sprayed and vibrated yet viscous enough to not flow off the fabric shuttering, even in the vertical spots. The innovative concrete structure offers more than a new method for constructing concrete shell structures: it’s aim is to be an intelligent, lightweight energy-producing system. This is achieved by careful assembly of multiple layers of building systems. Two layers of concrete sandwich together insulation, heating and cooling coils, while thin-film photovoltaic cells wrap the exterior surface. The residential unit, enclosed by this roof system, and an adaptive solar-shaded facade, is expected to generate more energy than it consumes. “We’ve shown that it’s possible to build an exciting thin concrete shell structure using a lightweight, flexible formwork, thus demonstrating that complex concrete structures can be formed without wasting large amounts of material for their construction” said Block in a press release. Because we developed the system and built the prototype step by step with our partners from industry, we now know that our approach will work at the NEST construction site.” You can view progress at the Dübendorf, Switzerland construction site via live webcam, accessed here. Sometimes research involves destruction in the name of creation. Architects and engineers from Zurich-based BLOCK Research Group at science and technology university ETH Zurich recently teamed up to build, and destroy, a vaulted masonry structure that was designed with advanced digital fabrication methods but constructed with traditional timbrel, or Catalan, thin-tile vaulting techniques. 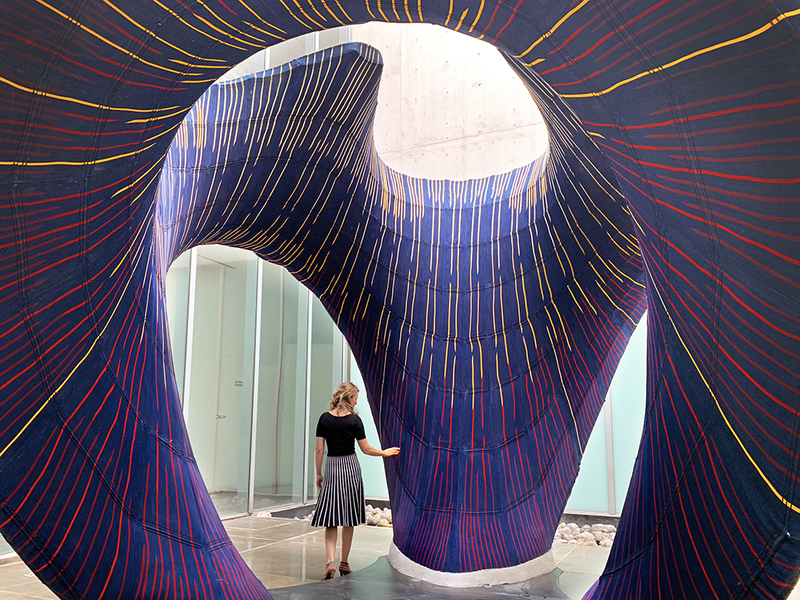 Through its research of freeform shells, tiling patterns, building sequences, and formwork, the group hopes to construct increasingly radical forms without sacrificing efficiency. Now rarely used, centuries-old timbrel vaulting methods were commonly employed in Spanish architecture and in many Beaux Arts landmarks. The form is known in the United States as a Guastavino vault after the Spanish architect Rafael Guastavino, who patented a version of the system in 1885. Traditionally, the vaults’ structural form followed a lightweight wooden structure that would guide the mason as he placed tiles. Using Thrust Network Analysis (TNA), a new form-finding method, the BLOCK group has created new possibilities for freeform vaulted shapes that can be constructed using a continuous cardboard formwork system. After creating irregular geometries with TNA, the researchers establish the shape of edge arches, close in the adjacent surfaces, breaking the pattern with a groin vault to begin another arch section. The group also aims to show that recyclable and reusable cardboard formwork could dramatically reduce the material and labor costs of construction while making complex vaults possible. Fabricated with a 2-D CAD-CAM cutting and gluing process and assembled on site, the formwork for the group’s Catalan prototype was supported by a system of stacked shipping pallets. These reduced the amount of cardboard used and allowed the unrolled cardboard pattern to fit the CNC equipment’s size requirements. The team implemented custom RhinoScripts to translate the self-supporting vault surface into machine code to produce 200 cardboard boxes. The group also discusses techniques for cutting tiles to be used in the prototype vault in its research paper, available here: “The most ideal cutting logic for the high double-curvature of the prototype vault would be a two-cut system, employing a combination of oblique and bevel cuts to ‘bend’ a surface in space.” Because of the tool constraints on this project, the team developed a simplified version of the cutting system that allowed for curvature in one axis of the tile while relying on hinging and the mortar joint to achieve a double curvature. Removing the formwork from the surface of the shell, also called de-centering, was another critical step. The supporting structure had to be removed all at once to avoid asymmetrical loading from below, which could cause the vault to bend and crack. In order to allow the formwork to lower slowly from the masonry surface, the frame sat on a series of sealed plastic tubes containing cardboard spacers consisting of a folded stack of cardboard sheets taped together. The team calculated the dry compressive strength of the spacers to carry the load of the shell, the pallet and box framework, and the masons. But once the vault was complete, the tubes were filled with water, which saturated the cardboard and caused it to compress under the load of shipping pallets. After successfully de-centering the structure, the team tested its strength, adding more than three pallets of sandbags to its surface before it finally collapsed. 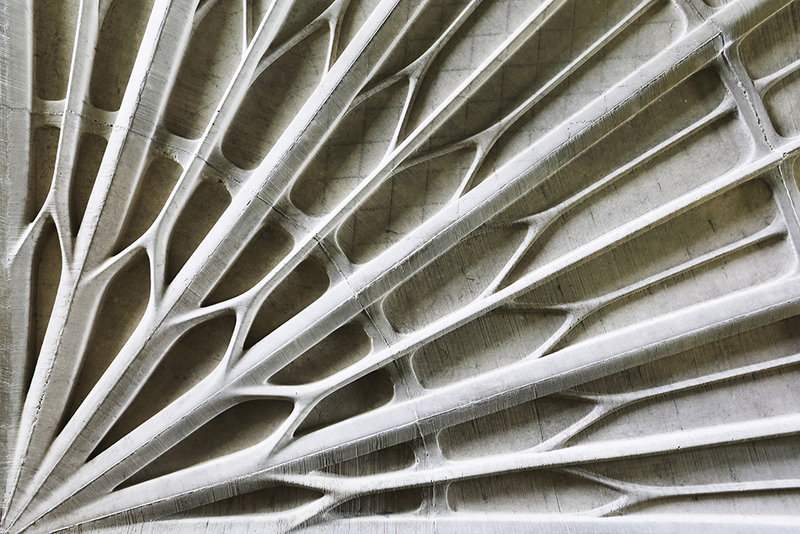 BLOCK’s future work will seek to streamline the TNA form-finding process as well as improve the efficiency of its construction techniques, ultimately working to identify design criteria like maximum vault curvatures with a range of tile sizes and patterns.